Fleeting Spirit gained a deserved first Group One success in the Darley July Cup under Tom Queally to become the first filly to lift the sprint since Frizzante five years ago. The winner had to survive a stewards’ enquiry after drifting in the final furlong but kept on well to score by a length and a quarter at odds of 12/1. This was the filly’s second outing of the season and followed on from her three-quarter length defeat when second to Scenic Blast in the five-furlong King’s Stand Stakes at Royal Ascot last month. Successful trainer Jeremy Noseda said: “Big thanks must go to Sean Murphy who rides her work at home. “When he rode her 10 days ago he said she had come on a huge amount since her run at Royal Ascot. “That was a great run today and she deserved it. Our horses were sick before Royal Ascot last year but she still ran her race in the King’s Stand. She wasn’t at her best for the rest of last season and I think the sickness earlier in the year may have left a mark on her. “The jockey rode a great race today but got there a bit too soon as she just idles in front. If she hadn’t jinked in the final furlong I think she would have won by three lengths. She was the winner on merit and these days the stewards are reluctant to demote horses that have won on merit. “You need things to go your way in these sprints and I think we have just missed the track record today (0.02s outside record). “The Darley July Cup is a great race to win. It’s good to send the Australians home packing! I am all for international runners in these big races but I don’t think they should be subsidised when they come over here. They should compete on equal terms. “This is the sort of moment you do this job for. Jockey Tom Queally was winning his second big sprint of the season, having partnered Art Connoisseur to victory in the Golden Jubilee Stakes at Royal Ascot. He said: “That was fantastic. She is a very, very good filly and has won decisively. She has a turn of foot and I was able to put the race to bed. “Six furlongs is probably not ideal for her but she still had the class to last home. “I think she might have just seen something out the corner of her eye and that’s why she drifted. 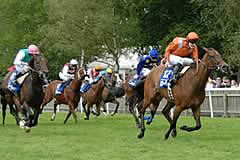 Con Marnane purchased Fleeting Spirit for 35,000 euros as a yearling at Goffs in September, 2006. The filly was sold again at the Tattersalls breeze-up in April, 2007, with agent Anthony Stroud going to 90,000 guineas for her. She is by the Group One winning sprinter Invincible Spirit out of an unraced daughter of the Group Three winner The Bean Sidhe. 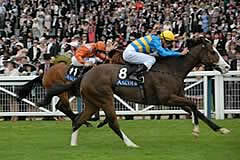 Fleeting Spirit was one of the best juvenile fillies in Europe in 2007. After a debut victory over the minimum trip at Nottingham in July, she went to Goodwood for the Group Three Molecomb Stakes on the final day of that month and posted a great effort in defeating Kingsgate Native by a neck. The runner-up subsequently defeated older horses in the Group One Nunthorpe Stakes. Stepped up to six furlongs for the Lowther Stakes at York in August, 2007, Fleeting Spirit came home third to Nahoodh but was promoted to the runner-up spot following the disqualification of second past the post, Visit. She returned to five furlongs for her next start in the Flying Childers Stakes at Doncaster on September 14. Ridden by Frankie Dettori, the filly was always prominent and saw off her rivals for a length and three quarters triumph over Spirit Of Sharjah. That success prompted connections to attempt six furlongs again and the filly made her final appearance of the 2007 season in the Group One Cheveley Park Stakes at Newmarket. Fleeting Spirit emerged with great credit as she failed by only a neck to overhaul the front-running Natagora, who advertised the form most impressively when winning the Stan James-sponsored 1000 Guineas at Newmarket the following season. Last season began with a stunning two-length defeat of Borderlescott in the Group Two Temple Stakes over five furlongs at Haydock in May, when she smashed the course record. On the basis of that victory she was sent off the 15/8 favourite for the Group One King’s Stand Stakes at Royal Ascot, but was just touched off by Equiano and Takeover Target, going down by three-quarters of a length. She was not seen out again until October in the Group Prix de l’Abbaye at Longchamp on Arc day, when she was a staying-on fifth behind last year’s Darley July Cup victor Marchand D’Or. Her 2008 season ended with a trip to the USA for the Breeders’ Cup Turf Sprint at Santa Anita on October 25, when she finished fourth. On her sole start this season the filly ran with great credit to go down by three-quarters of a length to Scenic Blast in the King’s Stand Stakes at Royal Ascot on June 16, staying on well after a tardy start. She won the Darley July Cup in great style today. The Searchers is a partnership consisting of current British Horseracing Authority chairman Paul Roy and leading jumps owner Andy Stewart. The duo are big fans of 60s music and named the partnership after the band of the same name who enjoyed hits such as “Sweets For My Sweets” and “Needles And Pins.” Paul Roy founded NewSmith Capital Partners, which he set up having previously worked for Merrill Lynch, where he was Co President of the Global Markets and Investment Banking division. Paul and his wife Susan, who are based at Ascot, owned their first horses in 1997, with their string in England split between Jeremy Noseda and Brian Meehan, Ed Dunlop and George Baker. The best horses owned to date by the Roys have been the 2006 St Leger winner Sixties Icon, Wilko, successful in the 2004 Breeders’ Cup Juvenile, Sarava, the shock 70/1 winner of the 2002 Belmont Stakes and Forgotten Voice, successful in the Royal Hunt Cup at Royal Ascot last month. Andy Stewart, born 1951, went to Felsted School in Essex and used to bunk off to go point-to-pointing at Mark Teys, while also hitchhiking to Liverpool to attend the Grand National meeting. He began work aged 17 in the fixed-interest department of Simon & Coates, eventually becoming a senior partner at that stockbroking firm. He became chief executive of Chase Manhattan Securities when it took over Simon & Coates. He founded broker Collins Stewart in 1991 and was executive deputy chairman when it floated on the Stock Exchange in 2000 before leaving the business in 2003.His current venture, Cenkos Securities, is named after one of his best racehorses. Cenkos won 15 races and over half a million pounds in prize money and was twice third in the Queen Mother Champion Chase at the Cheltenham Festival. Other good horses owned by Stewart, who was first involved with ownership in 1986 and really caught the racing bug when witnessing Desert Orchid’s emotional Cheltenham Gold Cup victory in 1989, include Le Duc, Le Roi Miguel, My Will, Celestial Halo and Big Buck’s. Born on September 17, 1963, Jeremy Noseda is based in Newmarket, where he has held a licence since 1998. Noseda, who grew up in London, was not born into a racing background, but loved the sport enough to learn to ride, and he spent summers working for Brian Swift and Jeremy Tree. He worked as assistant to Arundel-based handler John Dunlop (for six years), John Gosden (five years), and Sheikh Mohammed's global training operation, Godolphin (two years). Following the successes of Lammtarra in 1995, he was offered a training position in France by Sheikh Mohammed, but Noseda decided to become a public handler in California. Returning from the United States at the end of 1997, Noseda began training in this country with an initial string of about 50 horses, winning 18 races in 1998, his first full season at Shalfleet Stables in Newmarket. These successes included Noseda's first Pattern win in Britain in the Group Two Cherry Hinton Stakes at Newmarket, followed by a Group One victory in the Cheveley Park Stakes at the same course, both achieved by Wannabe Grand, who Noseda called his "iron filly". Wannabe Grand finished second in the 1999 1000 Guineas and Noseda's Kalypso Katie came close to Classic success when second to Love Divine in the 2000 Oaks and landed his first Classic when Araafa took the Irish 2,000 Guineas in 2006 while later in the same season Sixties Icon won the St Leger at Doncaster. Other good horses trained by Noseda include Balmont, Cassis, Peak To Creak, Just James and Carry On Katie, Fleeting Spirit and Sussex Stakes victor Proclamation. In 2004, Noseda made a successful visit to the USA when Wilko landed the Breeders’ Cup Juvenile. Tom Queally has come a long way since riding his first winner aboard the John Roche-trained Larifaari at Clonmel, Ireland, on April 13, 2000. Born on October 8, 1984, he was only 15 when enjoying that first success and was crowned Ireland's champion apprentice the same season. From Dungarvan in County Waterford, where his father Declan combines farming with a small training operation, Tom was out hunting on his pony by the age of seven. After a spell showjumping, he was a leading figure on the pony racing circuit by the age of 13 and was apprenticed to trainer Pat Flynn two years later. But that apprenticeship was terminated when Queally's parents insisted he finish his leaving certificate at school. At the end of a quiet 2002 season, when he was apprenticed to his father, he moved to Aidan O'Brien at Ballydoyle, winning the following year's Group Three Ballysax Stakes on Balestrini. With the help of Barney Curley, he moved to Britain in 2004 and joined David Loder's Newmarket stable, winning the British apprentices' championship that year. He won last season's Group Three Princess Elizabeth Stakes at Epsom aboard Lady Gloria and is now attached to Henry Cecil's Warren Place Stable. He came close to securing a first Classic victory when Midday only found Sariska too good in the Investec Oaks but gained a stunning success at Royal Ascot on June 20 when Art Connoisseur landed the Golden Jubilee Stakes. There was drama aplenty in the Darley July Cup, with the winner Fleeting Spirit veering left than right in the final furlong and taking ground from the runner-up Main Aim, who in turn swerved towards King’s Apostle. Main Aim, who started at 14/1, finished second, one and a quarter lengths behind the winner. Immediately after the race, Sir Michael Stoute, trainer of the runner-up, said: “He took a heck of a bump. He was badly interfered with.” As the result of the stewards’ enquiry was announced - that the placings remained unaltered - Stoute immediately left the paddock without further comment. There was pre-race speculation that the ground would be too fast for Main Aim, who has shown good form with some ease in the ground, but the trainer allayed those fears. “We thought the ground would dry out, but we walked it this morning and it hadn’t. It was good ground,” said Stoute. Mike De Kock, trainer of J J The Jet Plane who finished third, said: “He’s upped his form on the previous run [The Golden Jubilee at Royal Ascot in which he was fourth]. That’s probably as good as he is. Steven Arnold, jockey of the 11/8 favourite Scenic Blast, who finished 10th in the Darley July Cup said: “It was completely out of character for him.